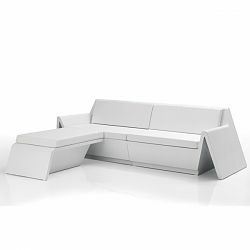 The contemporary design of the Rest sectional sofa is almost unlimited in the shapes and sizes it can form. The sections include left or right arm, corner, center, and an ottoman/leg chaise. A matching lounge chair and coffee table are also available. 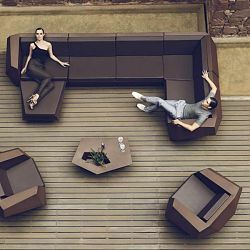 All frame pieces are made of rotationally molded of 100% recyclable polyethylene and resistant to extreme heat, cold and UV. The frames are available with a matte or high gloss lacquer finish in several colors. 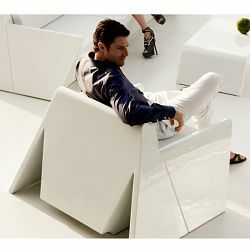 The cushion fabric is white Silvertex, a 100% polyester fabric. Other fabric choices are available. Please inquire. It is resistant to sun fading, mildew, temperature extremes and abrasion.